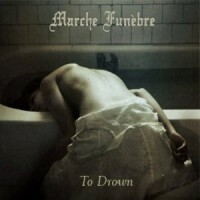 MARCHE FUNÈBRE, the Belgian Death/Doom Metal band that was founded in 2008, put out its first release in 2009. The EP was titled “Norizon” and contained 4 songs. I got a copy to review back then (see here) and to make it short, I was pleasantly surprised. The band showed great potential and I was quite anxious to see the release of the first full-length. This has now become reality, as the Belgian label Shiver Records released “To Drown” on the 1st June. Live-wise the band has shared the stage with a.o. THE ETERNAL, ISOLE and NOVEMBERS DOOM. But back to the new album, “To Drown”. This was recorded, produced, mixed and mastered in The Netherlands at the Excess Studios, where a.o. AFTER FOREVER, GOREFEST, AYREON, SINISTER and many others have recorded their material. The Belgian band ANGELI DI PIETRA also recorded their albums there. The recording line-up for “To Drown” differs from the current line-up: Roel Van Doorsselaere recorded the bass guitars and additional grunts, whereas Zoran Van Bellegem is the band’s current bassist. Roel was a fixed member during the time of “Norizon”, though. Guest vocals were provided by Hans Vanweyenberg (“Valley Of Tears”) and Yune Van Oost (child’s scream in “Regiment Of The Hopeless”). The lyrics for the song “Lethe” are originally by Charles Baudelaire from “Le Léthé” (“Les Épaves”, 1866), with official translation by George Dillon (1936). The cover art was in the hands of Brooke Shaden and is based on “Bobble Head”. Now for the songs themselves. My apologies beforehand for the comparisons, but that’s unavoidable. It doesn’t mean that I consider MARCHE FUNÈBRE a clone band. Far from it even. At first the band finds itself “Into Deadly Marshes”, where appropriate sounds and tension-building music (through the guitars and toms) can be heard. This is linked directly with the “Valley Of Tears”, which starts instantly. Not only the music, but also the hymnic clean singing. The song is divised into several parts and you can clearly distinct one from the other. At first there’s Traditional/Epic Doom in vein of CANDLEMASS, SOLITUDE AETURNUS, WARNING, …. This flows over into more powerful territory and the grunts are reminiscent of e.g. MOURNING BELOVETH. And so it advances, with changes in tempo and rhythm, but also vocally it’s not just grunts or cleans, but screams as well. With almost 10 minutes of playtime, the Belgians did provide quite a diverse track, whereas other Doom bands would choose a simpler way and strech the song, so to speak. In short, so far, so very good. In “The Well That Drowns Me” little drops of water can be heard, like “Into Deadly Marshes” also had its intro. Drums kick in, followed by slow, Funeral-ish Doom. The music is hard and dark with gutteral grunts. The clean change offers a nice contrast and goes into duet with the grunts in a musical canvas that is quite listenable. Again diversity and change is key to properly express the feelings, the happenings. A calm break precedes a more violent eruption. All in all another job very well done, although I had the impression that the song was stretched a little too much. “Regiment Of The Hopeless” is at least half as short (5 minutes), its intro consisting of a clean guitar with a soothing sound. But beware of the creepy edge, as if something’s about to give. The second guitar aids with the building and so the music gets heavier and heavier, while marching drums carry on all the while. The singing is delivered by grunts and screams. At some point I had to think of BOLT THROWER, only in a slower version. Nothing wrong with that, of course. MARCHE FUNÈBRE continue to deliver the goods, short song or long song. “Of Dreams And Vanity” also takes a direct start with growls and double-bass midtempo Doom. This higher amount of drive/push is very welcome, but as we’re dealing with a Doom band, the tempo is to drop soon enough. Clean vocals then take the lead, while screams and growls are used in an accentuating role. The straight-forward Heavy/Doom Metal gets a tempo boost like in the beginning. But that’s not all, as drummer Dennis Lefebvre even throws in some blastbeats. Powerful Death/Doom takes over for a while, after which the obvious drop occurs again. The guitar solo, although a little unexpected, does form a nice touch to the whole. The last part consists of clean singing in a sorrowful way. The music, logically, is inline with that. What else to say about this song? It’s diverse in tempo, it’s more sorrowful than the preceding ones (somehow) and the multi-vocal aspect is the other strong point. The atmospheric, clean start of “The Dark Corner” (with singing in a sighing way) is nothing compared to what follows. An outcry seems to be the sign for the music to burst loose. The powerful verses contrast nicely with the chorus, where the smell of death, the dark, the touch of agony cannot be denied. It definitely does not give you a feeling of hope or joy. Musically the focus lies on rhythm. And like before, the guys tried to not keep the compositions linear. Tempo increases are present, though limited in length. Everything is well executed and the vocal element is the finished touch. “The Dark Corner” is Doomy and varied, but is more creepy than the others. Which brings us to the massive song that is “Lethe”, clocking in after 18 minutes. Where to start? With the beginning, of course, reminiscent of bands like EVOKEN, THERGOTHON, FUNERAL, SATURNUS and so on. In other words, slow (duh!) Funeral/Death Doom, but with a good dose of melody too. This line does carry on and on, while the Metal aspect gradually increases in power and drive, offering more attack now and then. After a few minutes this makes way for a more Jazzy piece, of which I can only say: wow! The contrast is just huge, of course, but I find it great to hear this kind of change, implementation. The band then slowly rebuilds (during which a solo is played) towards a more aggressive approach, mainly in the vocal department. The full-flowing Heavy/Doom Metal even goes into an AMON AMARTH-like rush. Which is another wonderful highlight. Doom then again sets in after the rush, but there’s not that much difference with that (rush). It’s sounds almost the same, only at lower speeds. The general mood here is one of sorrow and mourning. The clean vocals add to this impression with their weeping touch. There’s one final, powerful outbreak á la NOVEMBERS DOOM and AMON AMARTH (to name just these) before the songs ends on a soft note. MARCHE FUNÈBRE put out a qualitative release in 2009 under the title “Norizon”. They showed the potential was there to take it further and farther, even if Doom is not as widely appreciated as Thrash, Death or Black. I definitely was looking forward to the first real album, though I tried to keep my expectations as low as possible. With the gazillion of releases being put out each month, it’s hard to stay focused on all. Having listened to the album several times, “To Drown” left me amazed at how the band has progressed in these two years. “To Drown” is an undertaking intro the darkest depths of life, lasting a good hour. So be ready when checking in. Each song stands out, even if similar compositions/structures were applied. One song may be darker than the other, another may have a creepy touch, another is focusing on sorrow and gloom and so on. To close off, I can only highly recommend this album. MARCHE FUNÈBRE are on their way to international recognition.